Figure 1. Clover planted as a cover crop has nodules containing nitrogen-fixing bacteria. Cover crops are specific crops not intended for sale but for soil improvement and sustainability. They are increasingly common in the agricultural fields of the Midwest and other grain-producing regions because of the wide range of benefits not just for the soil, but also the cash crop. In those systems, cover crops improve water and nutrient retention, promote microbial activity, reduce weed growth and insect pests, and improve plant growth. Similar impacts have been found in tree crops like apples and peaches, where cover crops are planted in row middles. As citrus greening (huanglongbing or HLB) can significantly impact root growth and nutrient and water uptake, the benefits from cover crops may be an additional strategy to improve Florida citrus production and reduce fertilizer and water inputs. One of the main benefits of cover crops is their contribution to the key drivers of soil health: soil organic matter (SOM) and soil microbial diversity and composition. One of the primary methods for increasing SOM occurs when soil carbon (C) is added to the soil, which drives increased soil microbial activity and decomposition. Unlike compost, which for citrus is often only applied at planting or periodically throughout the year, cover crop root mass and leaf litter can provide soil C inputs year-round. Increasing the SOM can also improve soil nutrient retention and availability. For example, increased SOM can increase the soil water-holding capacity and reduce the soil temperature. In citrus, this might reduce the amount of irrigation necessary and potentially allow for greater tree water uptake and reduced nutrient leaching. Changes in the soil microbial community composition due to increased SOM may include more plant growth-promoting bacteria, which can improve root growth, or changes in the abundance of nitrogen (N) cycling organisms. In a preliminary trial where bahiagrass was planted as a cover crop, a significantly different bacterial community composition was found after just six months in soils under bahiagrass compared to soils under the grower-standard of mowed weeds. We are currently investigating whether this composition change includes increases in plant growth-promoting bacteria that correlate with improved root growth and production. Cover crops can also suppress weed growth by directly competing with weeds for space, light, nutrients and moisture. Depending on the cover crop mix and timing, weed proliferation may even be reduced for the duration of the cover crop life cycle. In a preliminary University of Florida trial, planting bahiagrass as a cover crop reduced weed density by 95 percent compared to the grower-standard citrus row middles. Both broadleaf and grass weeds were suppressed by bahiagrass in this trial. Competition from a fast-growing and vigorous cover crop can prevent the emergence and growth of most annual weeds. Perennial weeds that regenerate from stolons, rhizomes or tubers are more difficult to suppress, but even their growth and reproduction can be reduced by planting a combination of aggressive cover crops. Chemicals produced by the roots of cover crops or from decaying plant residue might also inhibit germination of weed seeds and emerging seedlings and retard their growth and proliferation. The type and mix of cover crops planted can provide additional soil health and production benefits. 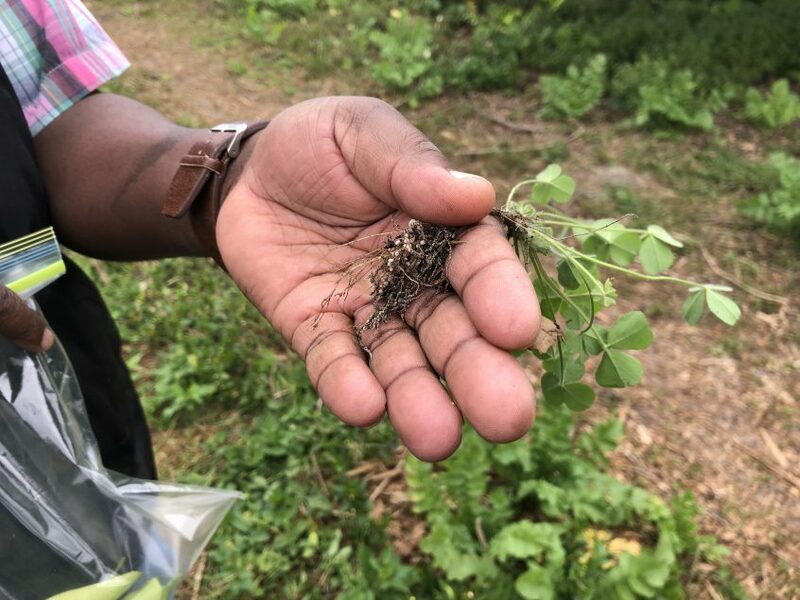 Legume cover crops, such as perennial peanut, sunn hemp and some clovers, can contribute to soil N (Figure 1), although the inoculation of these cover crops with rhizobia can be hindered by too much N fertilization. Cover crop biomass, and therefore soil C inputs, can also vary with variety. For example, sunn hemp can produce more than twice the biomass of sorghum-sudangrass. The cover crop species may also impact the soil microbial community, which could have implications for soil nutrient cycling and availability. 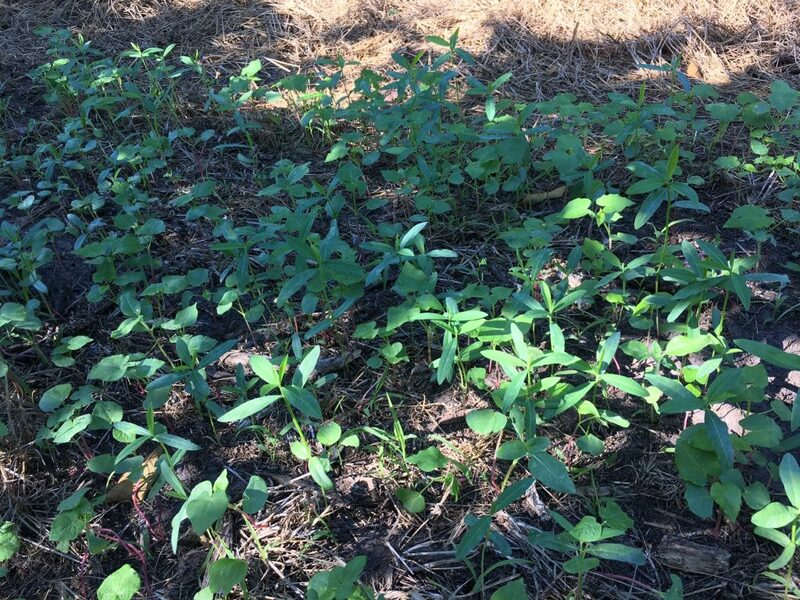 In a preliminary vegetable trial in Southwest Florida that examined different summer cover crops, the bacterial community composition was significantly different under three treatments: sunn hemp, sorghum-sudangrass and a no-treatment control. Timing cover crop production, mowing and incorporation of biomass, particularly those of legumes, to provide nutrients when most beneficial to citrus production is not well known but is currently being examined in field trials. Figure 2. A summer mix of cover crops planted in a commercial citrus grove (pictured a few weeks after germination) includes buckwheat, browntop millet, sunflower and sunn hemp. Most commonly used cover crops are seasonal. To keep cover crop biomass in a citrus grove, different cover crops need to be planted throughout the year. Typically, summer cover crops (Figure 2) are planted during the rainy season (June–September). A winter/spring mix is planted in January/February (Figure 2). It is critical to choose cover crop varieties that are adapted for these seasons, particularly the winter crop as precipitation will be limited (Table 1). The establishment time for cover crop varieties should also be considered. While perennial peanut has been examined for use in citrus and can grow well in Florida soils, it can take a long time to become established. Other peanut varieties may establish more quickly and may be more suitable for planting in citrus groves. To prepare citrus row middles for planting cover crops, the current vegetation should be mowed, and herbicide may be applied to reduce germination competition. Ideally, cover crops require minimal inputs, but germination and early stand establishment are substantially improved if rainfall or irrigation occurs soon after planting. The frequency for mowing the cover crops will depend on planting timing and growth rate. Standard mowing practices will keep the biomass within the row middles, providing additional soil C and nutrient inputs for that portion of the grove. Management for insect and mite pests is likely to be influenced by the addition of cover crops in groves. Including flowering plants like buckwheat and peanut in cover crop mixes in both agronomic row crops and other perennial fruit orchards in other regions has resulted in increased abundance and diversity of predatory arthropods. These help to reduce the number of pest insects like aphids, scales and mites. It is also possible that some plant species in cover crop mixes can attract other pests which may not be currently problematic in citrus groves. We anticipate that insect management practices will require different considerations than our current traditional production systems. 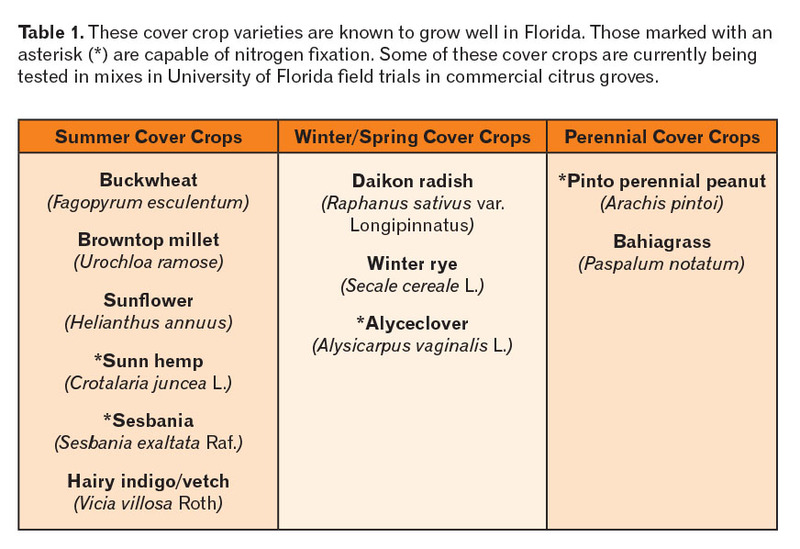 Cover crops are well studied in annual crops, but we don’t know as much about their influence on soil health and root growth in perennial crops, including citrus. There are many questions about the best mixes of cover crop species and the timing of planting, as well as how these combinations may impact soil nutrient cycling and water storage. The appropriate cover crop mix will largely depend on grove needs (e.g., increase SOM or weed management) and location (e.g., soil characteristics or weather). It is not clear what amount of nutrients are released into the soil from cover crops planted in a citrus grove, particularly those that increase N fixation. The possibility of interference of cover crops with citrus either by competing for nutrients or for moisture in dry weather conditions has not been fully examined. Little is also known about the economic benefits of cover crop adoption for citrus in Florida. Some considerations to keep in mind are capital investments in a planter (e.g., no-till planter), seed costs, labor and time needed to learn effective management of this system. We are currently working on field trials with commercial growers to address these questions. Based on preliminary data and conversations with growers who are already planting cover crops, it appears that cover crops may be extremely beneficial to Florida citrus production by improving soil quality and ecological sustainability. Sarah Strauss, Ramdas Kanissery and Tara Wade are assistant professors at the University of Florida Institute of Food and Agricultural Sciences (UF/IFAS) Southwest Florida Research and Education Center in Immokalee. Davie Kadyampakeni and Lauren Diepenbrock are assistant professors at the UF/IFAS Citrus Research and Education Center in Lake Alfred. Juanita Popenoe is a UF/IFAS Extension agent in commercial fruit production for Lake, Orange, and Marion counties.